Social media have been employed to assess public opinions on events, markets, and policies. Most current work focuses on either developing aggregated measures or opinion extraction methods like sentiment analysis. These approaches suffer from unpredictable turnover in the participants and the information they react to, making it difficult to distinguish meaningful shifts from those that follow from known information. We propose a novel approach to tame these sources of uncertainty through the introduction of “computational focus groups” to track opinion shifts in social media streams. Our approach uses prior user behaviors to detect users’ biases, then groups users with similar biases together. We track the behavior streams from these like-minded subgroups and present time-dependent collective measures of their opinions. These measures control for the response rate and base attitudes of the users, making shifts in opinion both easier to detect and easier to interpret. 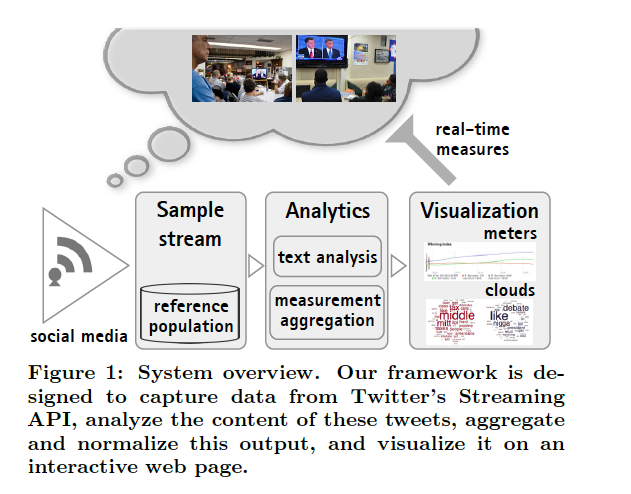 We test the e↵ectiveness of our system by tracking groups’ Twitter responses to a common stimulus set: the 2012 U.S. presidential election debates. While our groups’ behavior is consistent with their biases, there are numerous moments and topics on which they behave “out of character,” suggesting precise targets for follow-up inquiry. We also demonstrate that tracking elite users with well-established biases does not yield such insights, as they are insensitive to the stimulus and simply reproduce expected patterns. The effectiveness of our system suggests a new direction both for researchers and datadriven journalists interested in identifying opinion shifting processes in real-time.